A chicken preparation, these days Pasta’s favorite and I cooked almost thrice last month is, Aam Kasundi Murgi. Needless to say, it is enough for me to come up with the recipe of Aam Kasundi Murgi here in Debjanir Rannaghar. After all, the recipe is approved by my munchkin. 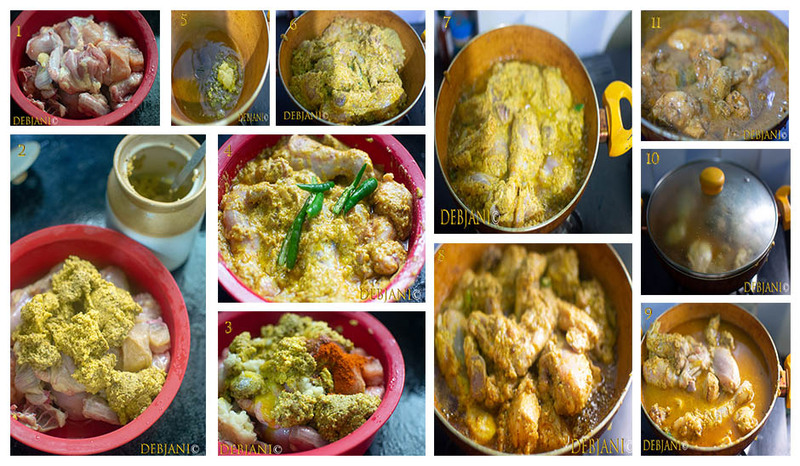 Another reason, for sure is, the simple cooking process involved in making the Bengali Style Chicken in Mango Mustard Sauce. It takes almost no time to cook this dish apart from the marination time. Last but not the least, I do have a big fat batch of homemade Aam Kasundi at home that needed to be used! 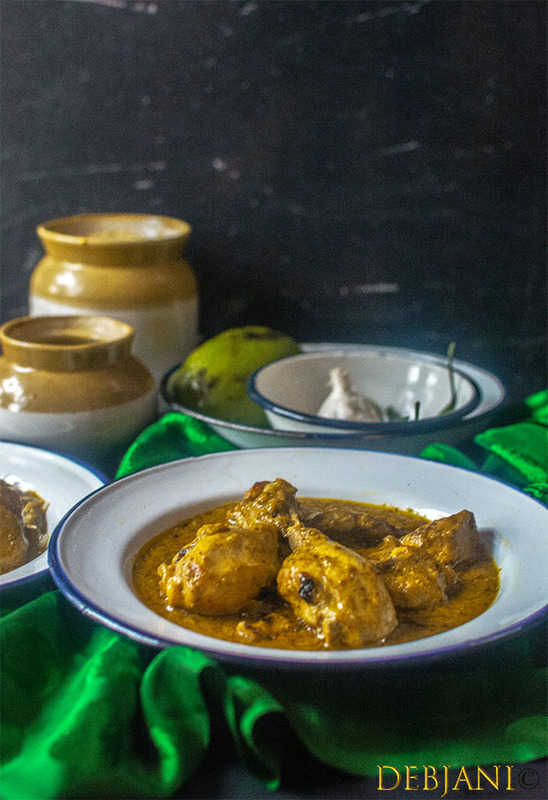 Aam Kasundi Murgi is a Bengali style Chicken curry prepared with Green Mango Mustard Sauce. A tangy, mustard and mango based chicken preparation, this goes really well with steamed rice. Before going further with the recipe, I must mention, this is not something I have grown up eating with. Cooking meat with mustard is not preferred at my parents’ place. There, it has always been the fish cooked with mustard. I for the first time, had the Aam Kasundi Murgi in a Bengali specialty restaurant. I found the dish good. To be specific, different than whatever we had with the typical onion garlic flavoring. Use of mustard, however, in Bengali cuisine is neither new nor uncommon. It is been ages we are using mustard oil as the medium of cooking and so is mustard seed or paste as a base. Typical Macher Jhal, Borir Jhal etc, are typically prepared with mustard paste. It is just I have not seen the chicken or mutton cooked with mustard at my place. Pasta so far never had the Aam Kasundi Murgi outside the home. She, in fact, had it for the first time this year. It was after, I made some Aam Kasundi at home this year. I found she was in love with the Aam Kasundi aka the Bengali Mango Mustard Sauce, a seasonal delicacy. 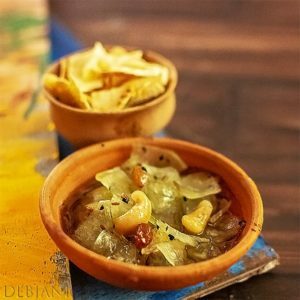 You may read here the recipe of Aam Kasundi and Pasta’s reaction (& action) with the same. However, upon seeing her enjoying the Aam Kasundi, I decided to cook the Aam Kasundi Murgi at home. The way I make Aam Kasundi Murgi! The recipe, however, is not adapted from any book or any restaurant. This is what I developed based on my preference. I am not sure, how they cook it in the restaurants or whoever cooked this dish at home. I have used homemade Aam Kasundi to make the Aam Kasundi Murgi. Needless to say, if you are not available with homemade Aam, use store-bought one. In fact, you may use Normal Kasundi along with Green Mango to substitute Aam Kasundi. Obviously, original aam Kasundi would work best though the combination is not bad either. For the rest, you need good quality chicken and a few spices to make this delicacy at home. Last but not the least, this dish involves a very simple cooking process. One thing I must mention here. This dish is having the punch of mustard. Not like a normal chicken curry instead it is a tangy one. You either like it or not. Mehebub for sure is one of them. His daughter, though is from the opposite group. Last but not the least, his daughter’s mother is not at all choosy about food and loves her portion of tangy chicken curry prepared with Mango Mustard Sauce. 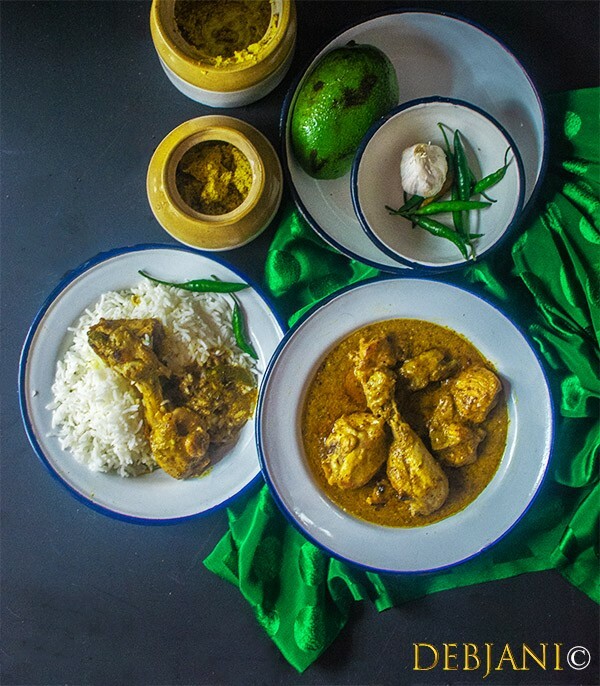 Aam Kasundi Murgi aka Bengali Style Chicken in Mango Mustard Sauce is a tangy chicken curry prepared with green mango and mustard sauce. Aam Kasundi/ Mango Mustard Sauce: 6-7 Tbsp. Wash Chicken chunks thoroughly under running water and pat dry before marinating with the spices. 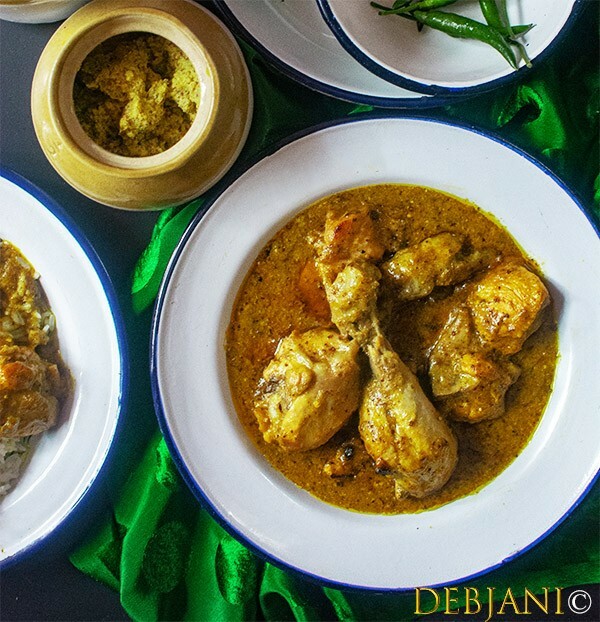 Marinate Chicken with Aam Kasundi, 1 Tbsp. Garlic Paste, Turmeric Powder, Kashmiri Red Chili Powder and Green Chili and 1 Tbsp. Mustard oil for 8 hours. Heat remaining Mustard oil in a pan. Add Garlic paste and fry for a minute. Now add marinated chicken with the spices and mix thoroughly. Add salt and cover the pan with a lid. Cook on low flame until the chicken softens. This will take around 20 minutes. Now add one cup boiling water and cook till you have the chicken curry with semi-thick gravy. Add ½ Tsp. Mustard Oil and give the curry a mix and switch the flame off. 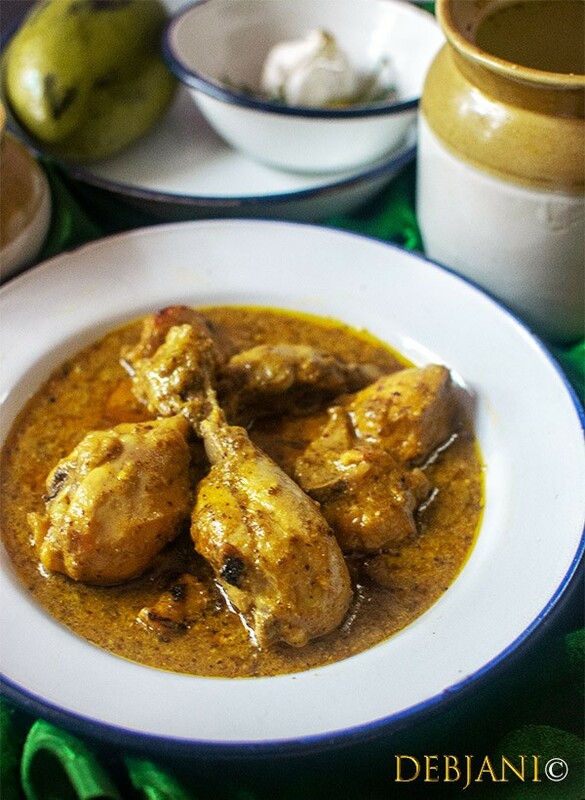 Serve Aam Kasundi Murgi with steamed rice. To make Aam Kasundi at Home: Use the recipe. If Aam Kasundi is not available to take one green mango and grate it and add the same along with 6 Tbsp. normal Kasundi to the chicken. If Normal Kasundi is not available, take the green mango along with 3 green chilies, 50g Mustard seed, 1 tbsp. sugar and 5 cloves of garlic and make a paste. This can be used instead of kasundi. 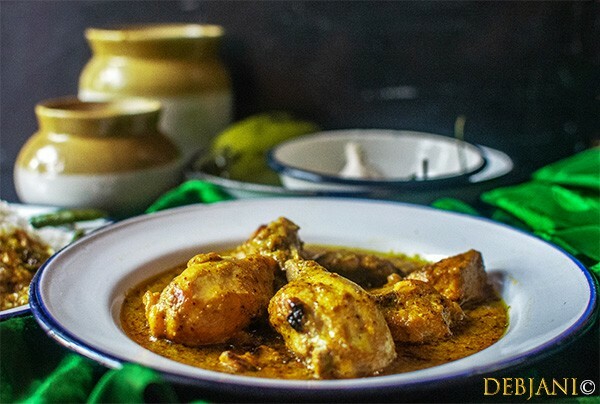 Have you tried the Aam Kasundi Murgi Recipe from Debjanir Rannaghar! « Lomba Dantiwala Begun Bhaja and Gol Muchmuche Begun Bhaja, two avatars of Bengali fried Eggplant!